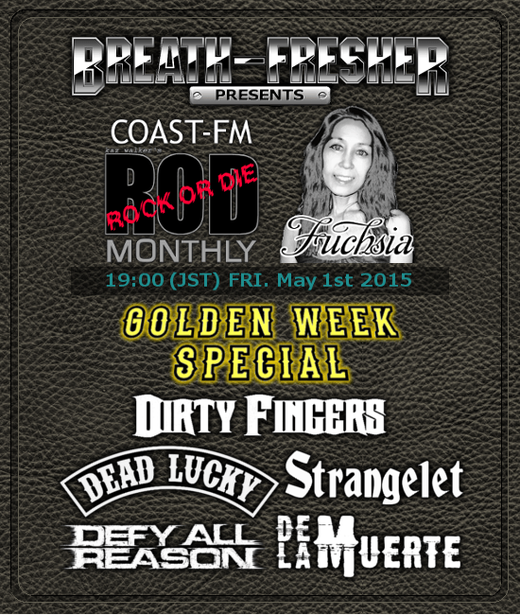 ROCK OR DIE Monthly #59 'GOLDEN WEEK Special' and is aired at 7:00 pm (GMT+9) on Friday, May 1st 2015. Following 5 bands will be featured on the show. After it was aired in Japan, it can be heard on a podcast on this site. DEAD LUCKY - Album "Sons Of Lazarus"
DEFY ALL REASON - Album "The Road Ahead"
DE LA MUERTE - Album "De La Muerte"
DIRTY FINGERS - Album "250 Dollars"
STRANGELET - Album "First Bite"